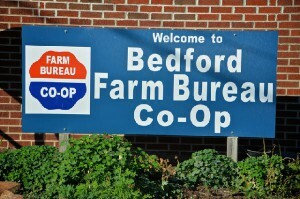 Bedford Farm Bureau Co-op Association was established in 1942. The Co-op is owned and operated by the people we serve. Here at the Co-op we strive to provide quality products and excellent customer service.Our four locations can service all of your agricultural needs.Our two feed mills offer top-of-the-line floor stock and custom blend feeds to meet your livestock and dairy animal needs. Our three fertilizer blending facilities will custom blend fertilizer to meet your crop nutrient requirements. Our in-house animal nutritionist develop rations to maximize the potential of your livestock and dairy animals. Our agronomists will help you to get the most out of your crops and soils. Our retail staff can answer your questions and help you choose the right products from our shelves. Content copyright . Bedford Farm Bureau Co-op Association. All rights reserved.